As we move through the height of our summer competition season, it is not uncommon to have multiple days of severe heat and humidity – the days when you sweat standing still. Heat and humidity can be harder on your horse than it is on you. Most of us have worked to motivate a sluggish horse through the final jump off or day 3 of a competition but why does it happen? Was our training off the mark? Perhaps they need a different energy source in their feed? Or was it that energy zapping heat and humidity? In the next few pages we will take a close look at the role of sweating in the horses’ ability to cool and how extreme heat and humidity can affect their ability to perform. What happens to horses while exercising in the heat? As the horse begins to work, heat is produced as a by-product of muscle contraction at a 4:1 ratio! As the body temperature climbs and adrenaline levels increase, sweat glands respond by producing a hypertonic (highly concentrated) salt solution that coats the hair. Under normal circumstances horses cool by evaporative cooling and convection. The movement of air over their body is paramount to both of these mechanisms. Evaporative cooling: The sweat coats the hairs and as air flows over them it pulls the moisture and the heat off the horse. Convection: Blood vessels near the skin dilate and allow the transfer of heat from the blood into the air. During intense exercise, horses can lose up to 10-15L per hour in sweat alone! Once their body temperature reaches greater than 42C, the respiratory system kicks in to help “blow off” some of the extra body heat (approximately 15% of the body heat can be dissipated via respiration). How does heat and humidity affect the horses’ ability to perform? 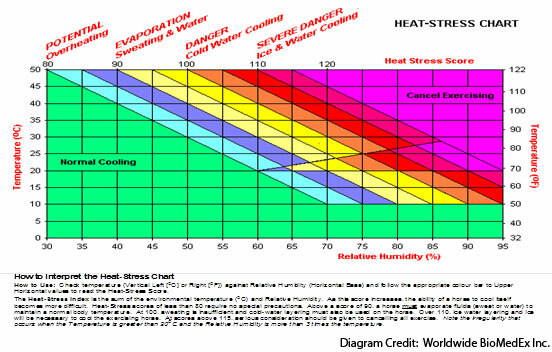 Perhaps the single most important calculation when determining the risk to your horse during hot and humid conditions is the “Heat Stress Index”. The Cole’s notes version of the H.S.I. is that it is that the temperature and % humidity must be considered together to explain their full impact on an athlete’s ability to perform. H.S.I. = 15C + 98% = 112 H.S.I. H.S.I. = 26C + 70% = 96 H.S.I. We are now safely down in the yellow zone where we would only need cold water for cooling after a hard effort. In humid conditions, the air is already saturated with moisture. This reduces evaporative cooling, allowing sweat to cling to the hair like a hot blanket and causes a rapid increase in body temperature. Horses’ that are struggling with overheating will often be “inverted” or seen to “pant”. Inversion: when the respiratory rate is higher than the heart rate (over a 1 minute count). It can look like the horse is ‘panting’. Once fluid loss (dehydration) has reached 5% of body mass (approximately 20-25L in your average saddle horse) there is a noticeable reduction in performance. Dehydration levels above 5% cause the athlete to feel ill as organ and brain function are impaired. It is also interesting to note that dehydrated athletes sweat less than normally hydrated horses (as the body tries to conserve any fluids it can). This further reduces the cooling mechanisms of the body, starting up a vicious cycle that can only lead to an overheated and severely dehydrated horse if not corrected early. How can we improve our athlete management under these circumstances? 1) Make a plan – discuss the day’s heat stress index with everyone at the barn so that all team members are aware of the risk and what they need to watch for over the course of the day. Early recognition is key! 2) Teaching horses at home to drink electrolyte solutions or accept syringed electrolyte supplementation is also a good place to start. Electrolytes can also be supplemented in the grain rations. Remember that horse sweat is a highly concentrated salt solution – there is approximately 10g of electrolytes per litre of sweat! Offer water frequently in between classes and ensure buckets are topped up when the horse returns to their stall. Not all electrolytes are created equal – and different electrolytes are designed for different types of work. A thoroughbred sprinting on the track requires different support than a sport horse competing over 3-4 days, in the same way a track star is managed differently from a marathon runner. Your safest bet is to discuss your options with your regular veterinarian and include them in the discussion of how to support the horses through a hot and humid competition. 3) Ensure horses (and riders) get frequent breaks out of the sun, have access to cool water and stable fans. If you notice a horse showing signs of heat stress (soaked in sweat, inverted respiratory pattern, dull eyes) get the horse into the shade and start cooling immediately while someone contacts the attending or show veterinarian. For veterinarians and riders if endurance horses, cooling horses becomes second nature with experience and education. The horse industry is littered with fallacy. Start by hosing or sponging cold water down the neck over the jugular veins, along the belly and in between the hind legs (look for the big dilated veins!). The repetitive application of cold water is the KEY to removing excess heat from the body. Continue to apply water to the body until the water coming off is not gaining heat. The addition of air movement will enhance heat removal from the body (natural breeze or fans can be used). You can soak the horse from “ears to tail” with cold water if necessary – “tying up” isn’t from the application of cold water, it happens inside the muscle as a result of dehydration and accumulated “cell garbage”. Heat Stress in horses can be very serious with potentially long-lasting impact on the ability of your horse to exercise during the heat. So take care to reduce the heat load of your horse during exercise, particularly during hot and humid weather. Stay tuned for the next article in this series which will look at common leg injuries and treatment modalities available.